Formulated For Those with Sensitive Skin and Hair. Prevents Skin Irritation and Conditions Scalp. Tena Body Wash and Shampoo, is a multi-use gel wash that is formulated for cleansing and conditioning fragile skin and hair. Specifically formulated to leave hair smooth and soft to the touch, this wash also leaves the skin feeling cleansed, moisturized and smelling fresh. Conditioning, anti-static properties such as provitamin B5 gently detangle hair, making this a good shampoo for the elderly and the best moisturizing body wash for anyone with fragile hair and skin. 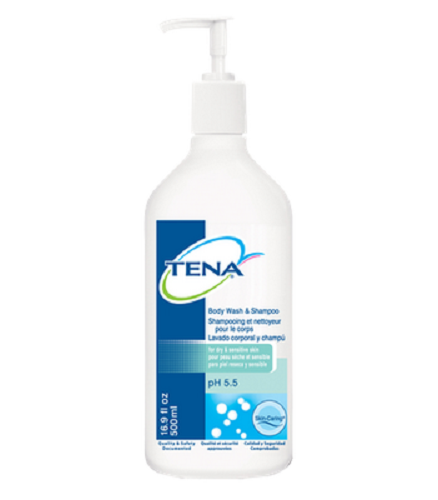 Tena Body Wash and Shampoo is a good shampoo for those who are sensitive to regular shampoos and soaps that can so often wreck havoc on sensitive skin. Elderly people and those whose skin is prone to irritation after bathing will find relief using this bath and body wash. This pH-balanced wash leaves the scalp in great health and gently washes impurities off the skin. If you're searching for the best moisturizing body wash for sensitive, fragile skin, look no farther than this revolutionary and gentle skin cleanser and shampoo. This 2-in-1 shampoo and body wash makes bathing a breeze - sans irritation. Conditioning body wash and shampoo both included in one compact bottle.